This turned out to be the fastest, cheapest and most flavorful dish that I’ve made in a long time. You need some special ingredients, however. A few pounds of mussels. At 2-5 dollars a pound I usually do a pound a person or more. 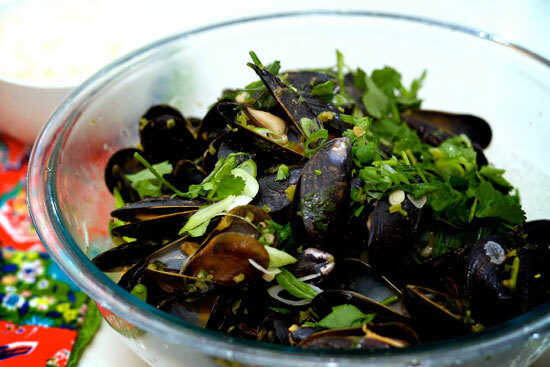 Get the mussels rinsed ready and waiting before you start- it goes quickly. Add a can of coconut milk, a few tablespoons of fish sauce (any asian supermarket will have the big bottles, and western markets have teeny expensive ones in the “from everywhere else in the world condensed into one aisle” aisle. It’s flavor is directly proportional to its smell. If the smell brings you to the edge of losing it on the spot, you’ve got the good stuff. I like the brand with three crabs on the front.) A few tablespoons vegetable oil, and a hefty spoonful of curry paste. Bring that to a boil. When it’s as hot as it’s going to get without bubbling over, toss the mussels in, put on a lid, shake the pot a few times to distribute well and let cook on high heat for no more than 3 minutes. No more! Place into a large bowl, top with cilantro and green onions sliced as thin as possible on the bias. Serve with rice. When finished with the mussels, spoon the remaining sauce over the rice until you have a hard time moving.